The purpose of this series is to raise the awareness of every day people who may not know much about praying and seeking God, as well as giving information from leaders and ministries, with both local and global perspectives. 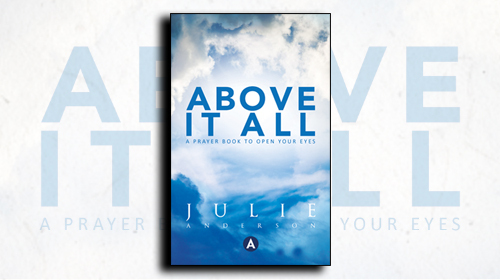 AIA (Above it All) is a magazine style series of programs designed to teach the effectiveness and importance of prayer. It shows viewers how to be involved in effective prayer, and helps them grow wherever they are, facing the circumstances of their own lives. The testimonies from others are important of how, through prayer, you can overcome difficult circumstances and live on higher ground. By praying people, we mean, people bringing the future into the now through heartfelt prayer. People who are giving themselves permission to dream, and are learning how to talk to God in prayer, that brings results. The series brings a prophetic edge to what is happening around the world, and as it develops we hope to bring you more help through our website presence, with a) results of answered prayer through interviews and testimonies b) training manuals & resources through the new Spearhead Products available in our online resource shop with downloaded printable notes, and mp3’s. c) offer downloadable scriptures prayers for you to pray for yourself and your family which are relevant to the program and to your needs. This 4 part series will inspire your spiritual life, and challenge the condition of your heart, your attitudes, the words of your mouth, and thoughts. When your eyes are opened with revelation from heaven, you pray with a tangible faith and your future changes. This prayer book birthed this first series of programs and gives foundational principles to help you develop a prayer life that rises above your circumstances as you discover your destiny and where, when, and how to pray. Praying people, speaking God’s Word, carry influence. They truly become world changers. Praying God’s Word means you are speaking in His Presence and sight (2 Corinthians 2:17 Amplified) A scripture prayer builds you up into your heavenly inheritance (Acts 20:32 Amplified) and brings peace of mind, that engages your heart with focused faith. Julie teaches on prayer and living a life of faith that’s put into action. These four lessons will inspire, motivate and encourage your prayer life. Within this teaching you can learn what praying strategically means, understanding God’s appointed times and Kingdom tasks for you and the nations. This 5 part series covers one of the most satanically fought truths of scripture; the level of authority that we as God’s children really have. Authority begins with the acceptance of responsibility. These teachings will unlock many questions believers have. The hallmark of Christian discipleship is agape love. This course outlines God’s love at work in us and through us. Extreme intimacy is what the Holy Spirit wants to have with us. Let’s learn how to cooperate with Him, and watch what He will do for us, in us, and through us. The contents and use of this site are subject to the following terms and conditions found here.We ask that you take the time to read these and follow the guidelines as set out.